A true action film will get only as much respect as its lead actor's skills and reputation can give it. Even then, it's only a matter of time before that good action film will be reclassified as a suspense or thriller. "The International" could be a case in point. 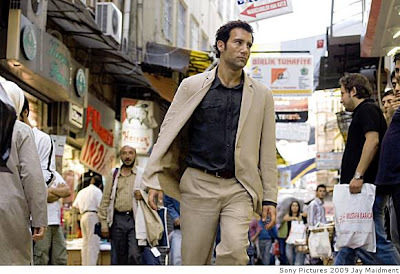 Directed by Tom Tykwer ("Run, Lola, Run") it stars Clive Owen as an Interpol agent taking on a Goliath-size global bank and exposing its corrupt practices via lots of action, suspense and thrills. True to its title, "The International" was filmed in five countries and two continents and co-stars Naomi Watts. We checked in with Owen, the film's unconventional action hero with extra passport stamps, who spoke to us by phone from Los Angeles. Q: What made you want to take on the lead role in "The International"? A: It was a combination of reading the script and speaking with the director, Tom Tykwer. It reminded me of one of those '70s paranoid thrillers. It was well researched and still a great, sweeping and entertaining thriller. Q: What excited you about playing agent Louis Salinger? A: He's somebody who is obviously angry, passionate, obsessive and hotheaded. He's also morally outraged. I was attracted to a character who was like a dog with a bone - refusing to let go. He's also very fallible. He's not an obvious heroic character. He's a bit of a mess in his own life. His obsession with justice is at all cost of everything else in his life. There's something to admire about the commitment of a man willing to go to any lengths. Q: The villain in "The International" isn't a person, but rather the institution of a bank. Did the timeliness of this occur to you at the time of filming? A: No. It certainly felt like a relevant story. But there was no way we could have realized that we'd be in this position with all that's happened since. The big questions of the movie are: "Is this huge corporation behaving appropriately? It is it handling our money properly? Is it an institution we can trust?" These are all questions everybody is suddenly asking now about these huge global banks and the like. It's incredibly timely. Q: It's not quite in the "Syriana" territory, but "The International" has a slightly complex story line. Did it take a few readings before you completely understood the subject matter? A: Certainly, some of the intricacies of the way a bank works had to be read carefully. But the story was quite clear and full of well-written ideas. It doesn't get bogged down in factual stuff. Q: Were you at all surprised in learning how villainous a bank can be? A: Banks are involved in conflicts around the world, because where there's money involved, so will be the banks. There is a ridiculous amount of guns across the world, and every one of them is bought and sold. Banks somehow have to be a part of that. It's money. One of the most telling things is how keen banks are to control debt. With debt comes power and control. Q: Is the energy of a film influenced when the set moves around as much as "The International" does? A: Definitely. With a whole new country comes a whole new crew and a totally different environment. The Grand Bazaar in Istanbul, the Guggenheim in New York, taking over the main square of Milan for two weeks. Environment is a big part of this movie, not only in terms of the countries we visit, but also the architecture. There are lots of great images of small human beings set against epic modern architecture, which embodies this faceless corporation that you can't connect with. Q: Action films are like guitar solos. If they go on too long and go over the top, it can leave people rolling their eyes. As the lead actor, how do you keep the tone in check? A: Ha, ha! That's very true. Ultimately, it's the director's job. He's directing, choreographing and setting the tone. When suddenly we've gone to this epic shootout in the Guggenheim, I'm trying to put people in that situation for real. I could run around posing and trying to look cool with a gun in my hand, or I can do what I think Salinger, an Interpol agent, would do. He'd be absolutely terrified. So you're witnessing it on that level and not watching me as an actor in a movie. It's no different from doing a dialogue scene. The International (R) opened this weekend at Bay Area theaters. To see a trailer for "The International," go to links.sfgate.com/ZGAW. E-mail Delfin Vigil at dvigil@sfchronicle.com.